Here at Go Auto Outlet, we carry one of the widest varieties of used vehicles in the Edmonton area. It’s so wide, it almost seems difficult to pinpoint which ones we’d recommend to you right away. Sometimes, we even gloss over vehicles in our own inventory! That’s why we want to feature some value vehicles in our inventory that don’t get as much attention, right here on our website. What’s even better is that vehicles like these usually fall under our dealership specials, so don’t sleep on any of our fantastic offers! Keep up to date on our blog to see what value vehicle we’ll feature next. 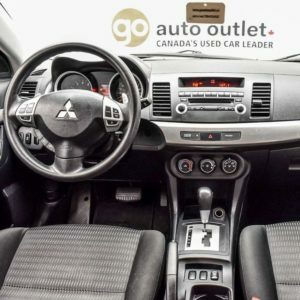 This week, we’re featuring this 2012 Mitsubishi Lancer. It comes in a SE AWC trim with a Rally Red Metallic color for its exterior. In addition, its odometer clocks in at 143,052 kilometers so this car still has a lot of life left in it. We here at Go Auto Outlet can’t wait to show you more about this vehicle so read on to find out more! On this particular Lancer, it has a lot of cool features for you to make the most out of it. 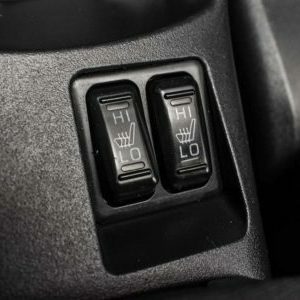 For example, both of its front seats are heated, with a 2-setting switch so you can lower and balance the temperature when the seat gets too hot. Another great feature that’s heated are its side view mirrors. Do you always find it difficult to scrape the ice off your side mirrors when it hits -30 outside? You won’t have to worry about that anymore with these heated mirrors. This 2012 Lancer also incorporates keyless entry with its own set of keyfobs so you don’t have to fiddle around your pockets or purse to unlock your car. Just walk within proximity of the vehicle and your car is unlocked! For the price of this 2012 Lancer, you’re getting fantastic performance and even better fuel efficiency. 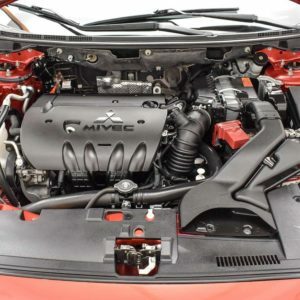 Its 2.4L I-4 engine gives you a great horsepower of 168 hp and 167 lb-ft. worth of torque. In relation to its engine size, you’re getting incredible fuel economy with 9L/100 km in the city and 7L/100km on the highway, giving you a superb 8.1L/100km combined. It also has a fuel tank capacity of 59 litres, so you know its fuel economy truly delivers with its numbers. Lastly, this 2012 Lancer is perfect for winter driving as it features an All-Wheel Drive (AWD) with the option to switch between 2-Wheel Drive (2WD) and back. That way, you can save even more fuel in the summertime when you don’t need all that power. Overall, this Lancer makes for a great vehicle to own if you’re looking for both optimal performance, great convenience, and intuitive control over how you use its power. Its a vehicle we’re proud to feature on our used vehicle spotlight! But no matter which vehicle you decide to choose, you can count on all of us here at Go Auto Outlet to help make it an easy process. Come visit our dealership to learn more about this 2012 Lancer, or any of our other vehicles in our inventory. You can even book a test drive on our website if you’ve already decided which one you have in mind!